The economy is improving, but the U.S. is still struggling with an investment drought. Capital spending by business is 26% below the long-term trend, and has not yet recovered to pre-recession levels. By comparison, personal consumption has topped its pre-recession levels, and is much closer to the long-term trend. Against that backdrop, it is notable that AT&T announced yesterday that it expected a capital spending budget of $22 billion per year for the next three years. To put this in perspective, the *entire* motor vehicle industry invested less than $20 billion in the United States in 2011. In some ways, AT&T’s willingness to make a public announcement of a capital spending target three years out is a challenge to Corporate America (though the company certainly does not frame it this way). By making this public statement, AT&T is effectively saying that it believes in the communications revolution, data-driven growth, and the strength of the U.S. economy. Why can’t other companies make the same sort of public announcement of long-term capital spending goals and offer additional certainty to the still recovering U.S. economy? Truthfully, growth is suffering more from investment uncertainty than from regulatory uncertainty. If large companies pledged to maintain or increase domestic capital spending over the next three years, it would go a long way to boosting economic and job growth. With the election now over, the Obama Administration should hold up AT&T–and other companies willing to invest in America–as examples of what to do right. If Obama wants a high-growth economy with prosperity for all, he needs to encourage more companies to make the same kind of bet on America’s future. Today, the broad communications sector is an innovation success story in an otherwise sluggish economy. And that success feeds on itself. The Internet companies have access to bigger potential markets as the broadband providers deepen and extend their networks. The broadband companies benefit from innovative applications that drive traffic and demand. And the applications developers, small and large, are able to take advantage of new capabilities. This interconnected and self-reinforcing collection of industries is reminiscent of the early stages of past booms, which were never driven by a single industry. In this case, the employment expansion of several communications-related industries, despite the overall weak labor market, is a sign that the broad communications sector is going to be a leader in the coming recovery. Now there’s a new study from Rob Shapiro and Kevin Hassett which provides confirmation of this thesis, as it applies to 4G. we find that the adoption and use of successive generations of cell phones from April 2007 to June 2011, supported by the transitions from 2G to 3G, led to the creation of more than 1,585,000 new jobs across the United States. Moreover, every 10 percentage point increase in the penetration rate of 3G and 4G phones and devices occurring as we write today — in the last quarter of 2011 — should add 231,690 jobs to the economy by the third quarter of 2012. This implies that accelerating the rate of 4G adoption, in whatever way possible, can accelerate job creation. Good stuff! President Obama should take a moment this morning to applaud Google’s acquisition of Motorola Mobility. This deal is a case of an innovative and job-creating American company using its cash stockpile to invest in another American company–billions that will almost certainly be followed by more billions to develop new and innovative products. Rather than sitting on its profits, Google is doubling down on the mobile sector, and the result is almost certainly going to be more investment and more jobs in the U.S. In a critical sense, Google is justifying its reputation as a force for disruptive innovation by putting its money behind its words. The company could have stayed in search advertising, and continued to collect its billions in income more safely. Instead, it’s turned itself into a full-fledged competitor to Apple in the mobile ecosystems space. For the U.S. economy, the Google deal is nothing but good news. We’d be a lot better off if other companies with cash followed the Google example of investing in innovative U.S. companies–and President Obama should say so. Seems like a pretty straightforward story, doesn’t it? The Journal is quoting directly from authoritative BLS data to demonstrate that the wireless industry has been losing jobs, despite the mobile boom. The big picture message: Innovation does not equal job growth. Unfortunately, the reporters and editors at the WSJ fell into the same trap that has ensnared many other journalists, policymakers, and even economists. They looked at the label on a piece of official economic data, and assumed that they understood it. But as we saw during the financial crisis and subsequently, government economic data can all too easily be misinterpreted. The BLS definition of the “wireless” industry does not include company-owned retail stores or stand-alone company-owned call-centers. The customer service numbers cited do not include company-owned retail stores or stand-alone company-owned call centers. The 2007 occupational data in telecom cited in the story cannot be compared with later years, because the telecom industry classifications in the occupational data were substantially redone in 2008. The phrase “employment at U.S. wireless carriers hit a 12-year low” simply cannot be supported by the available data. 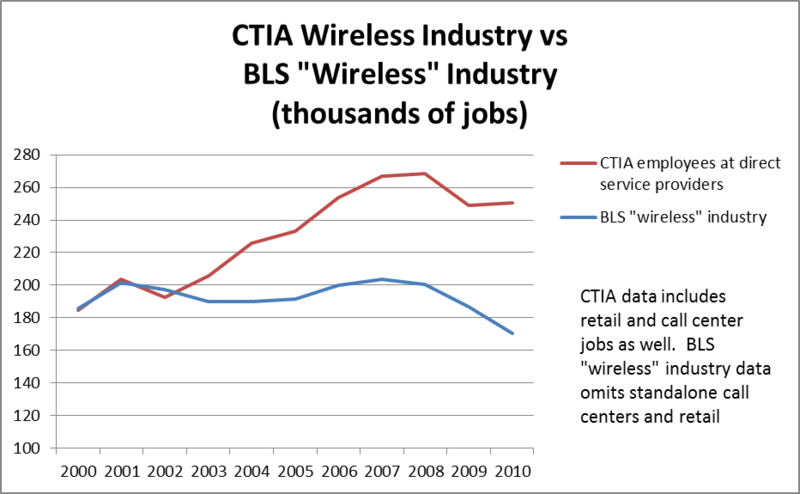 Data from the industry trade association (CTIA), which shows wireless employment up 36% since 2000, is much more plausible (see chart below). In my view, the WSJ article is a classic case of misinterpreting official statistics. Before getting into the details, why am I taking the time and trouble to disassemble this particular article?Historically innovation and job creation have been closely linked, as I have argued in multiple papers and articles. With Washington now fighting tooth and nail over the budget, it’s very important for policymakers to understand that successful innovation creates jobs, not the opposite. Second, journalists, policymakers, and economists need to understand how easily government statistics can be misinterpreted. For example, the statisticians at the BLS have reported huge U.S. productivity gains over the past decade, including the years following the financial crisis–a fact that has been duly repeated by journalists and applauded by economists. However, in a recent paper, Sue Houseman of the Upjohn Institute and I argued that these reported U.S. productivity gains could be interpreted, in part, as an increase in the efficiency of global supply chains. It matters enormously for jobs and wages whether productivity increases are coming from more efficient domestic operations, or more efficient offshoring. Or consider consumer spending. Journalists regularly report that “consumer spending accounts for 70 percent of economic activity.” (see, for example, this recent Associated Press story that ran on the New York Times website). However this number, calculated by dividing consumer spending into GDP, is pernicious nonsense. Nonsense, because consumer spending includes a big chunk of imports, which does not correspond to economic activity in the U.S. Pernicious, because it perpetuates the fallacy that the U.S. cannot recover without gains in consumer spending (see my blog post on the subject here). Now let me turn to the details of the WSJ’s mistake, or if you’d like, misintepretation. 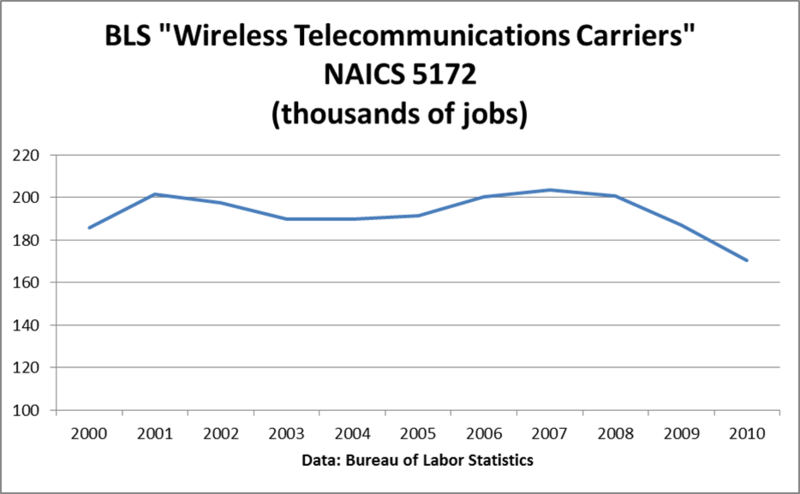 The WSJ analyzed BLS jobs data for the “wireless telecommunications carrier industry”, (with the NAICS ID 5172). That data looks pretty bleak (if you want to download the data for yourself, instructions are at the end of this post). An establishment is an economic unit, such as a farm, mine, factory, or store, that produces goods or provides services. It is typically at a single physical location and engaged in one, or predominantly one, type of economic activity for which a single industrial classification may be applied. Whenever possible, the BLS assigns each establishment to an industry, and counts all the employment at that establishment at part of that industry. Viewed from this perspective, a single wireless carrier, such as Verizon Wireless or Metro PCS, will typically include several different types of establishments, each of which will be assigned to a different industry. There might even be more different types of establishments in the wireless industry…it’s hard to tell. This has several implications. First, retail expansion by wireless providers is counted in the retail trade industry, not the BLS “Wireless Industry” numbers that the WSJ used. This is true even if the store is carrier-operated. 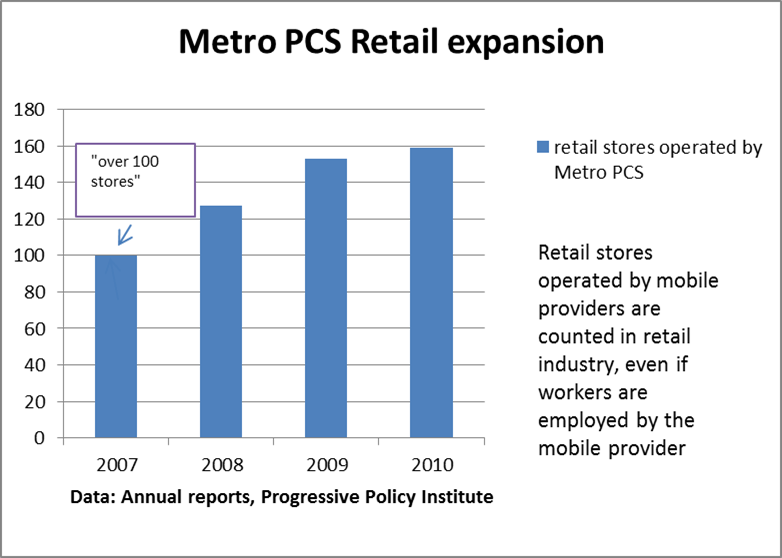 For example, the tremendous expansions of retail stores by Metro PCS in recent years, with added jobs, did not show up in the WSJ data (for a related example, employees at Apple stores are counted in the retail industry, not the computer industry). Second, to the degree that wireless carriers are expanding stand-alone call centers, those additional jobs are not being picked up by the WSJ data. We don’t know exactly how many there are, but we do know that overall national employment at telephone call centers have been rising, surprisingly enough. It’s likely that the expansion of the wireless industry is a factor in that rise in call center employment. Verizon Wireless has announced via Facebook and Twitter that it will expand its Sanctuary Park Center of Excellence Loyalty Retention Center by opening an office in Franklin. The company plans to add some 300 jobs in the Franklin area over the next 18 months. The company ran its first training sessions in May and plans to begin taking calls at the center starting July 5. I didn’t research this example any further. 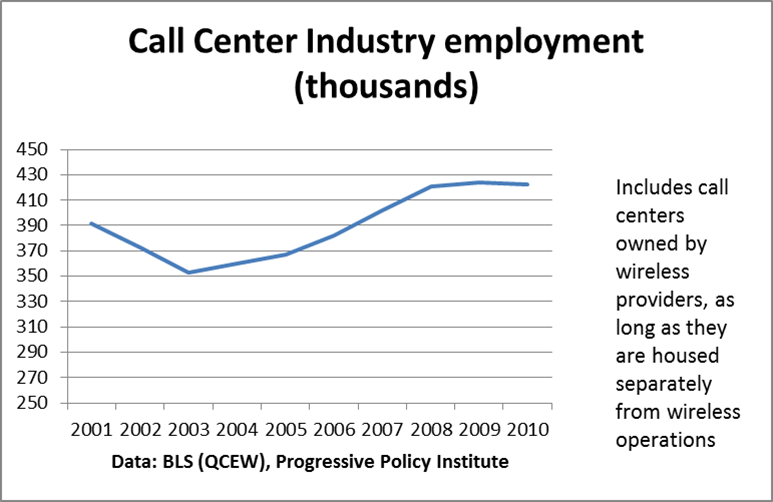 But it looks like these new call center jobs are not counted in the BLS data that the WSJ was using. Finally, those customer service figures that the Journal made such a big deal about. Let me repeat the quote from the Journal story. Actually, that sentence is not correct as it stands. The WSJ is citing occupational data pertaining to the “wireless” industry as defined by the BLS (NAICS 5172). 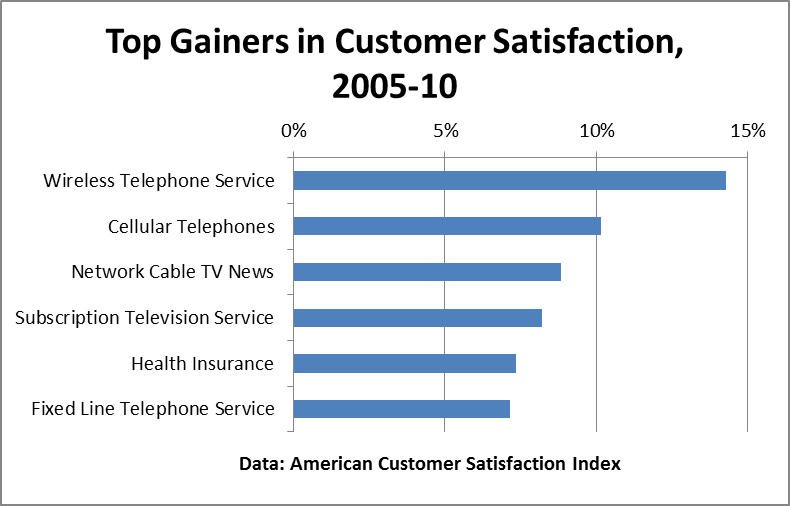 By definition, the WSJ’s figure for customer-service workers excludes company-owned stand-alone call centers (like the previous example for Verizon Wireless). As a result, the figures cited by the Journal are absolutely useless for determining whether wireless carriers are hiring or firing customer-service workers. In 2008, the OES survey switched to the 2007 NAICS classification system from the 2002 NAICS. The most significant revisions were in the Information Sector, particularly within the Telecommunications area. The implication is that telecom occupational data from 2007 simply cannot be compared to later years (I believe that the BLS would agree with that, if asked). What’s the bottom line here? Let me show you again the chart of the jobs in the BLS “wireless industry” (the data the WSJ used), and compare it to the survey of wireless industry employment done by CTIA, the wireless industry association. The industry association figures-rose by 46% from 2000 until 2008, before dipping by 7% from 2008 to 2010. By contrast, the BLS “wireless” data, which does not include call centers, retail stores, and tower construction, rose by only 8% from 2000 to 2008. Now, honestly, in the middle of a wireless boom of historic proportions, which figure do you think is more likely to reflect “employment at wireless carriers”, the phrase used in the WSJ story? Now, that brings me to my final ethical question: Does the Journal have an obligation to run a retraction or a corrective story? The article did not slander or libel anyone, and the reporter used the government statistics in good faith. However, because the statistics did not mean what the Journal thought they meant, the story is filled with statements which leave readers with the wrong impression. The typical reader would read the story and naturally conclude that the phrase ” employment at U.S. wireless carriers hit a 12-year low” referred to the number of workers who receive paychecks from Verizon Wireless, Metro PCS, the wireless part of AT&T, and the like. But as we have seen, that phrase is based on government figures that only reflect a portion of wireless carrier employment. More importantly, the story’s big picture conclusion–that innovation does not equal job growth–is not supported by the statistics. In this era of distrust of the press, should publications make an effort to clarify the record if their original story is faulty? 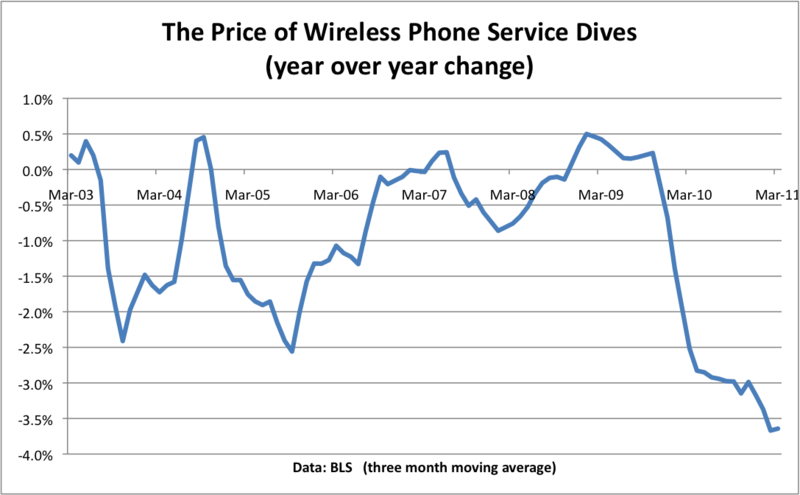 This morning’s CPI report show that the price of wireless phone service is falling at an accelerating pace. 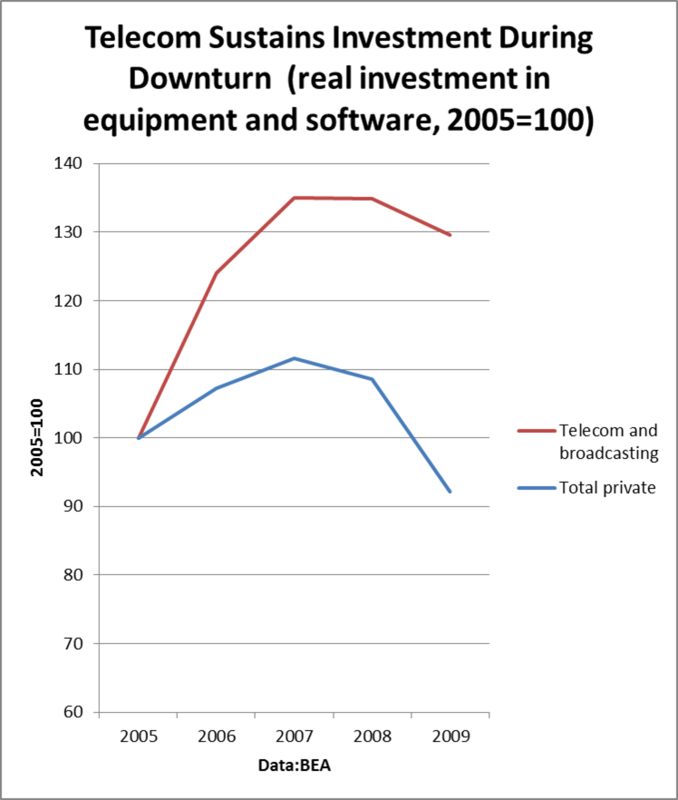 That suggests the communications sector is becoming more and more important as a driving force for growth.